Spotted on Tour - a new @WilsonGolf blade in @GaryWoodland's bag! Credit to Golf.com‘s Jonathan Wall for being the first to spot what appears to be new Wilson Prototype blades in Gary Woodland’s bag in the Bahamas. A few hours later, Wilson Staff tour pro Brendan Steele posted a Tweet of his own on the new irons, noting that he was part of the design team. The cat is officially out of the bag. So new blades and Gary Woodland? What in the name of Gene Sarazen is going on here? Wilson’s current blade, the FG Tour 100, was released in 2014 as part of Wilson Staff’s 100th anniversary as a golf brand. This new prototype features a few similarities to the Tour 100, including the same bore-through hosel, but the muscle back is a little simpler looking and it appears to be more toe-weighted. We’ve reached out to Wilson for more information, and the company confirms they’ve been waiting for a chance to test the new prototypes with its Tour staff, specifically Brendan Steele. It’s shaping up to be a busy fall for Wilson Staff. We’ve been through Driver vs. Driver, and the introduction of Cortex, and a replacement for the two-year-old D300 irons and metalwoods is due by January. Wilson’s FG Tour V6 irons are also two years old, and considering Wilson’s two-year product cycle, MyGolfSpy’s 2017 Most Wanted Player’s Iron is also due for an upgrade. The other part of the story, however, is what’s up with Gary Woodland? According to Wall’s article, Woodland is an equipment free-agent, sort of. After leaving Callaway at the end of 2015, he signed a metal-woods only deal with TaylorMade and has been using Titleist irons and wedges without a deal. Woodland will apparently be gaming the new Wilson blades, as well as a Wilson FG Tour V4 utility iron, at this week’s Hero World Challenge. The three-time PGA tour winner is currently 32nd in the Official World Golf Rankings, and it remains to be seen if this week represents an equipment trial on his part or a prelude to a new equipment deal with Wilson Staff. If that were to happen, Woodland would be Wilson’s highest ranking Tour pro. Brendan Steele, Kevin Streelman and Padraig Harrington are currently ranked 103rd, 176th, and 187th respectively. Good and beautiful design for looking. I would like to hit ball by it as soon an possible.Since new muscle iron have been very rare,I like the type of irons. I have some questions,some forged maker is very rare too,which maker made by? These clubs really are quite striking. Comparing todays “blade” with yesterdays “Butterknife” is like comparing todays Ford against the Model A. You have to hit the old basic tiny blades and Persimmon to understand where Golf has gone to from the old days, and it has not necessary for the better as skill was far more then than now. But as they say time moves on and so do the riders of the wave. Absolutely. Always a judgment call as to when forgiveness is too much for any given level of player, and of course the inability to feel where on the face contact is made is a hindrance to learning how to be a better and more precise player. But I’d say most of the modern blades still retain that. Also, if you’re a competitive player, the question is always a relative one. I guess whether a specific competitive player leans toward this kind of club depends on how many shots he thinks he is or isn’t giving up over a multiple-round tournament. It’s a legitimate question. But relative to the rest of the field, it’s also a critical one. If you’ve got top-quality players packing clubs with game-improvement features, and it makes a difference of even a shot or two every round, you’re asking yourself to be that much better than players that are already about as good as you are (or, sometimes, better). I actually appreciate pros who aren’t totally selling out to the clubs that are absolutely most easy to hit and most forgiving. I do think some of them recognize that it’s possible to let imprecision creep into your swing when your clubs are fixing the results of it all the time. I had a friend and frequent tournament partner once who played as a pro (we both did, actually), and I saw this very thing happen when he went away from Wilson and Hagen blades (really) to some Armour perimeter-weighted irons. He was probably the most consistently precise striker I ever played with, and within a few months he had started to hit all kinds of dead-looking shots that he wasn’t even perceiving as toe-hit (and other variations of off-center). Yes Joro, the old days are always better right? Players were better, equipment was better, music and movies were better. Women were better, men were better. It’s all downhill!!! Woof. And again I say, woof. Played Staff blades for pretty much an entire competitive career, and anybody who thinks the kind of “blades” they’re putting out now (across all manufacturers) are as unforgiving and hard to hit as they used to be just hasn’t spent enough time with them. I’d be surprised if these weren’t like other modern blades, considerably more forgiving than a generation ago, but still with the ability to feel where you’re hitting the ball on the face. At any rate, Wilson has several other recent options for good players that have gotten rave reviews. It’s absolutely great that they continue to try to tweak the traditional-looking blade at the same time they’re hitting it out of the park with clubs like the V6. 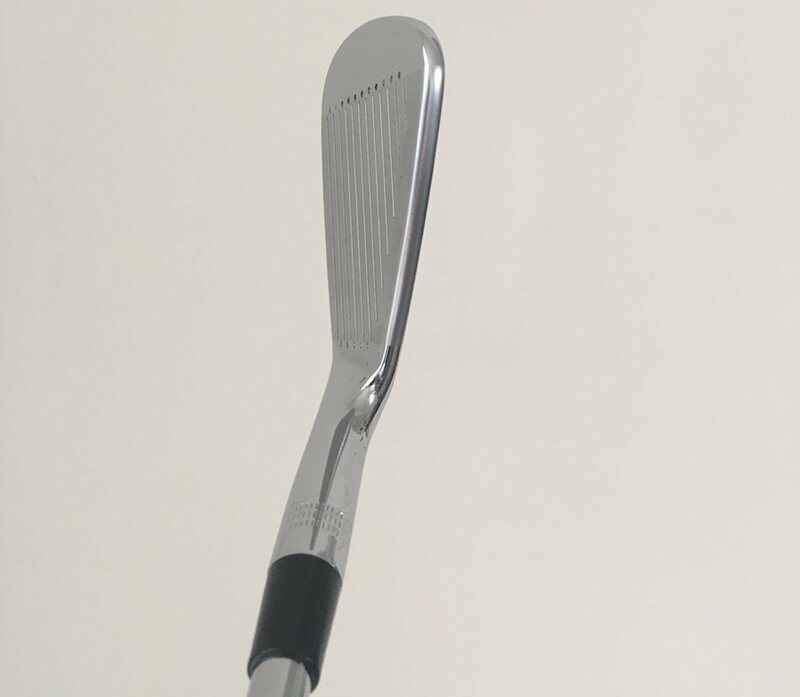 The FG-62 was also a great traditional-look-but-more-forgiving club that better players just loved. That kind of club has a lot of trouble getting big traction because so many people out there think they can’t hit them, or that they’re not any different than 30 years ago, but it’s just not true. … but hey, how about not closing the face on that address view (in the photo)? Nice, if you can play them…fun to hit on the range just to see how far off you really are compared to Pro players…. My ego is saying “Yes,Yes,Yes”. In this case, your brain might need an adjustment. If you haven’t hit some of the new so-called “blades” (which aren’t blades in any meaningful sense compared to how they used to be), you might be surprised how playable they are for somebody not in the single-digit-or-better category. I love the way the hosel blends right into the leading edge. Looks PERFECT from the back angle. The sole appears to have soft contours and looks like it would GLIDE through the turf. I wish a rep were in my area! Super excited to see these in person. They look like they have a great shape. Excited to see all the items Wilson brings out! Bore through. Ugh. Not great for us tinkerers. Wilson Staff is punching all the buttons on this one……..would like to see post tourney comments from Gary Woodlands on these. The FG Tour 100 have a great shape. They have quite a large profile and very little offset. I guess the new blades wil not be much different. For anyone that is thinking about buying a new set of blades, I would recommend that you have a look at the new blades when they are released. Please, please, please release these in a raw finish. The V6 has the raw option, and I’m really hoping these follow suit. nice, clean, classic look for sure, but i’m much more in the demographic that is looking forward to seeing the D series replacement. I hope they “smooth in” where the weight is removed from the muscle. Really hope. That would be classy. I use to play Staff Blades back in the day when the sweet spot was the size of a dime. Today I game MP 32’s and can’t find something better for the money OEM’s want today. I agree with the guys who feel any type of GI iron just doesn’t instill the confidence or the look throws them off. I have hit some GI irons and they feel great but looking down at them, they don’t look right in my eye. I play to a 9 HCP and any GI iron hasn’t made me shoot any better. I love my blades and would totally game this new Wilson but for $1200 plus would they make me any better than my MP’s? Probably not. So until I wear out my current sticks, I will stick with them. But kudos to Wilson for getting back to their former glory. Hopefully they announce a replacement for the V6 soon and I can grab a cheep used set. These are not really traditional blades. 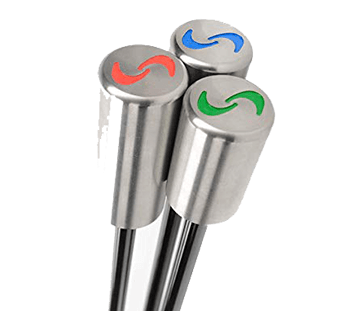 The weight on the lower toe at the rear of the head serves to reduce the MOI just like any other peripheral weighted head. 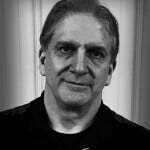 Other than looks, which is a personal preference, the most important distinguishing characteristic of any club head is whether there is significant energy transfer to the golf ball when struck away from the center of percussion, i.e. the “sweet spot”. Given this technology was introduced commercially maybe 50 or more years ago, it is actually much older than that, with the old PING and TITLEIST irons, the average player, who hits maybe 2-4 solid irons each round, there is little to be expected in the way of increased performance from the newer generations of irons. The changes are mostly marketing to convince golfers they can buy a swing instead of developing it on the practice range. Wait two or three years and pick up a set for $300 or so. Meanwhile, there are always the FG-62s or even the FG Tour V6s (or V-4s). Totally agree re game improvement, except that I don’t think they feel all that good. To me, mostly they just feel dull. More like the absence of bad on a mishit rather than anything particularly good on a good swing. This company has more wins than all the other companies. The design make sense but the graphics could be a little better the straight cut-out section would have been a good place for STAFF and the W/S badge. Satin or a satin chrome combo would look a little cleaner too. All in all a it looks like it could perform. Look great, it would be nice if Wilson got more of a foothold, they do make nice clubs. they just need their longer clubs to get more tour support. Remove the goofy looking badge on the toe and replace with a stamp or milling and I’ll bite. Save badges like that for the chunky cavity backs, it just looks cheap on these blades. Looks like an old set of Haigs that were CNC milled in another generation. I liked the FG Tour 100 blades but these look even better IMO, especially at address. Yes, that’s right, they are pulling in some WS heritage for this blade – what’s wrong with that? WS were THE preeminent blade in the 70’s. I played Staff Fluid Feel irons back in the 70’s and 80’s and they were a great set of blades. There’s something about that bore through hosel that makes for a solid feel through the ball. I’m assuming that the milling is to allow for more weight in the toe, which will move the center of gravity from the heel side to middle of the face. It may be a limited market, but just because you can’t play one, doesn’t mean you should dismiss this blade outright. Just looking at the “STAFF” logo. They look exactly like TaylorMade SP730. Does anyone know if Wilson and TM use the same factory? I wonder why more companies don’t bore-thru on their irons to save weight? Very clean & classy look. Kinda boring!! Remind me of the blades from 20 years ago!! Other than the weight distribution, more like 30 years ago. In other words, gorgeous. Personally, I don’t go for looks at all. I go for how well I hit the ball with them! 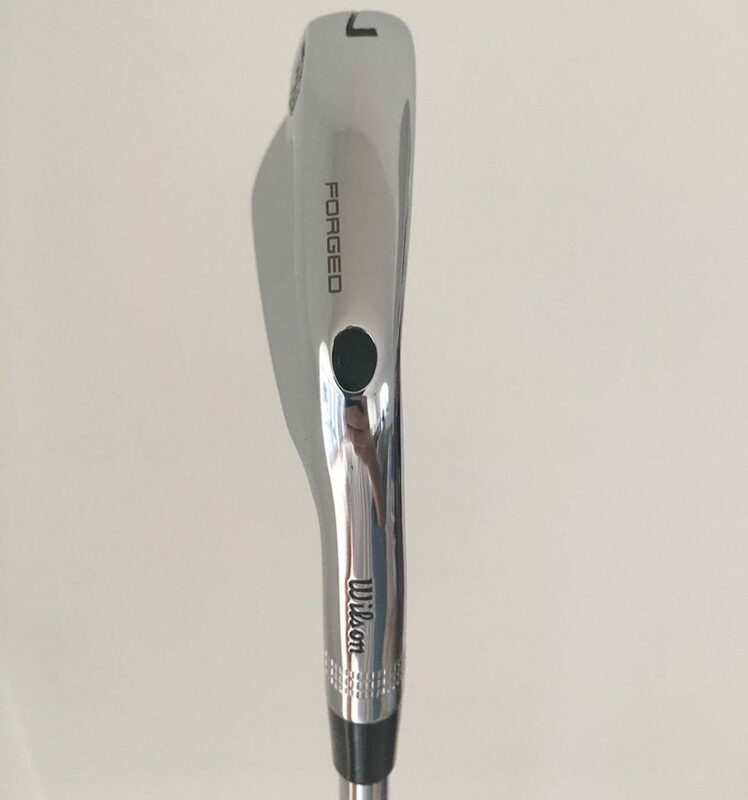 If I could hit them I’m sure I would want them just like I do everything else….But I do agree that this is yet another zero Tech iron that for the money spent should be on either game improvement irons …. Or just keep what you got and get some lessons…. Personally when I do decide to get a set of blades I want some that are calssic, old with style and of course some x100s. 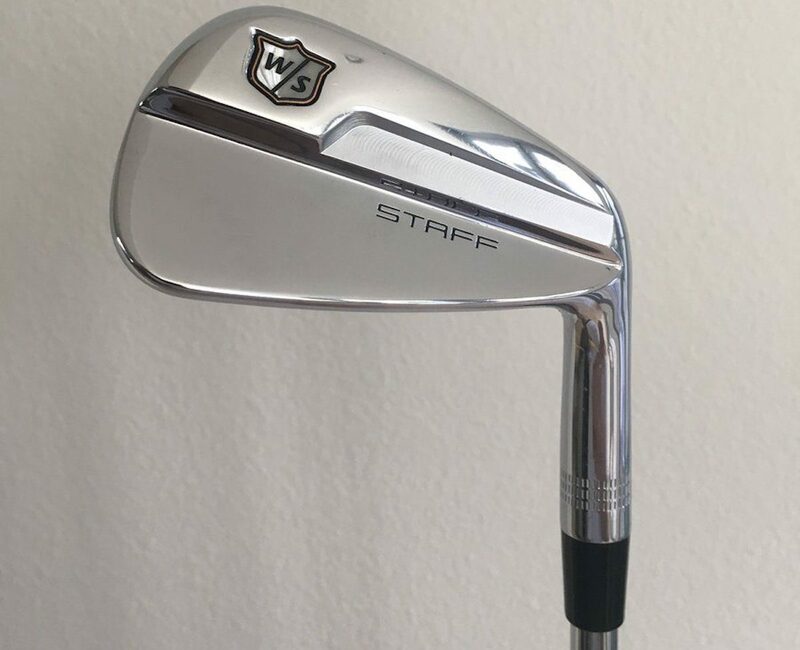 Those are just re-imagined 1970 Wilson Staff “DynaPower” with “Fluid Feel”.. ha, ha..Good luck with those..
Those blades look exactly like the “Old” Wilson Staff blades I played in the early 70’s.. the bored hosel had a red plug in it too. That is exactly what i was thinking. They are just missing that little red W/S plug in the middle of the blade. Would be nice if they’d think about just a bit of the red and white in the stamp on the back, in the finished version. I played Staff blades pretty much exclusively for a longish competitive career myself. Beautiful! Just wish I was good enough to hit them! Not hating on Wilson at all but I just don’t get why people get excited about irons like this. Honestly I personally don’t think they look all that great and why anyone would want to step back 30+ years in technology is beyond me. Couldn’t MGS use the same argument against clubs like this that they use when they talk about boutique putters or “wall hangers” that are made to be attractive but have zero tech to help your golf game? What benefit does even a pro golfer gain out of a set of irons like this? If they are looking to play irons with such little forgiveness then why aren’t they playing some persimmon woods to match and maybe an old blade putter too? They use huge drivers and high MOI putters to help their game and then make the game harder when they mishit iron shots? The current golf ball doesn’t spin enough to work it as much anymore and pros aren’t trying to hit massive hooks or cuts unless they are in trees. Even worse is they’ll probably try and charge $1200+ if they bring them to market. I guess I should clarify some. I think they look good if they were hanging on my wall as an office ornament but I think they look terrible if I’m standing over them about to hit a shot. Hey Robby, just what kind of benefit do you think a pro player needs in regards to his irons? The benefit he is looking for is being able to control his ball flight at his will and not at the will of the club head itself. The next time these guys are in your neighborhood, head on out to the range and take a gander at their ball flight and report back letting me know how it relates to your game. They obviously see a benefit. There are quite a few players on tour that still use blades. Pros (and for that matter anyone who plays blades) aren’t just looking to move the ball right or left. They want to move it up and down as well while tightening dispersion from front-to-back. There’s also the very simple element of wanting to play something you enjoy looking down at. I learned the game with a set of old blades and putting anything behind the ball with too much offset or a thick top line actually makes me less confident over the ball. I currently play Nike Vapor Pro Combo irons because I wanted more “help” over the Titleist 735s I was playing, but I don’t like the longer blade length and will probably switch to something like the Titleist CB or Mizuno MP-18 line when I upgrade again. People play clubs like this because they’re already pretty good players, and/or they want to get better. Most people who haven’t tested modern so-called “blades” don’t understand the differences between them and the clubs they were making a generation ago. There’s a lot more forgiveness than most people expect, but not so much that you lose all feel of where you hit the ball on the clubface. I use a mixed bag of the FG tour 100 (P-7) and FGtour V6 (6-3). Love the way they hit; excited to test the new blades out. I too am looking forward to blending these with their V6 replacement. Although I really like my V6’s all the way through the bag. Both Steel and Woodland are very strong and long hitters…they can handle the ‘Blade” for me a 15 handicap I’m sure they would help me reach a 20. You might be surprised. A lot of so-called “blades” these days don’t hit anything like actual blades — much more forgiveness than you might expect (see FG-62s and a pile of others). Also, they might actually help you learn to hit the ball better. You don’t want something that’s _too_ hard to hit, but having a club that lets you know when you’re missing the sweet spot by a lot isn’t a bad thing. It’ll improve you. Classy, elegant looking blade. I like it. Nice job Wilson.